The iSpring RCC7 is a small reverse osmosis water filtering system that uses a 5-step filtration process. This is one of the budget choices we included on our list. In the following article, we take a closer look at this reverse osmosis system, and we discuss its efficiency, filters, and installation, revealing why this is a good filtration system despite its accessible price range. This unit is small enough to fit in a standard kitchen counter cabinet. Most people will be able to install this unit by themselves, despite the rather poor written instructions that come with it. Fortunately, there are helpful video tutorials online, and you can also contact iSpring’s customer service if you encounter any problems. The filters used by the iSpring RCC7 offer a layered protection against any contaminants that might enter your water source. The first filter is housed in a transparent housing, so you won’t have any problems inspecting the sediment filter. This will allow you to know when it’s time to change the filters before the water quality begins to change. One of the advantages of using this unit is that it comes with a 1-year money back guarantee. If you’re not satisfied with the water quality, you can send the product back during this period and have your money back. All you need to do is to register your unit on the manufacturer’s website, and then you’ll be eligible for this guarantee. Another advantage is that this filtration system comes with a nice-looking faucet. The faucet has a solid brass construction and a brushed nickel finish, making a good addition to most kitchens. This RO system is considered efficient. Reverse osmosis systems produce a large quantity of wastewater for every gallon of water they filter. An RO system is considered efficient if it manages to filter the water without wasting more than 4 gallons of water for every gallon of pure water they produce. With a wastewater pure water ratio of 2.5:1, not only is this model considered efficient, it’s actually above average when it comes to efficient units. Using an efficient unit will prove worthwhile in the long run because it will lower your water consumption, thus lowering your bills. It is also more environmentally friendly to waste less water. 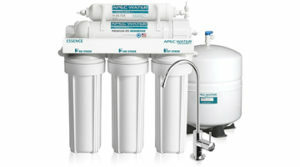 The iSpring RCC7 uses a 5-step filtration process. This means the water goes through 5 different filters before reaching the water tank. Every filter is specialized to block larger or smaller particles, and the resulting water has a better quality, and it’s healthier. The filters are easy to change, and you should change them every 6 – 12 months, depending on your water source. The reverse osmosis membrane has to be changed once every two years if you want it to function at its best capacity. If your water source is very contaminated, you might need to change the filters more often than once every 6 months. You will be able to see when it’s time to change the filters, thanks to the transparent housing of the first filter. If you see the filter is very dirty, you should change it at once. The filters are easily found, and they’re cheap. This unit is rather easy to install, especially if you have some previous experience with working and installing things around the house. Most people with some DIY skills will be able to install the RO system by themselves in under two hours. If you want to install the unit by yourself but you don’t have any previous experience, we recommend you follow the video tutorials online rather than the written indications. The instructions manual is poorly written, and even if the images might help, you can find yourself stuck at some point during the installation. Another disadvantage of the manual is that it doesn’t make a difference between the 7-stage and the 5-stage models. If you require further advice and instructions, you can contact iSpring’s customer service. Their experts can guide you through the installation steps. During the installation, we recommend you use the Teflon tape offered by the manufacturer to make sure your filtering system won’t leak. Helpful Customer Service – The customer service experts really know what they’re talking about and they will provide valuable information on every problem you might encounter. Efficient – With a water efficiency of 2.5:1, this is an efficient reverse osmosis system that will keep your water consumption and bills low. Great Value – This RO system has a decent price, and it offers a lot for the price, making it a great value item. Poor Instructions Manual – The instruction manual that comes with the unit is not as helpful as you might think. It would be better to rely on the video tutorials to guide you through the installation.